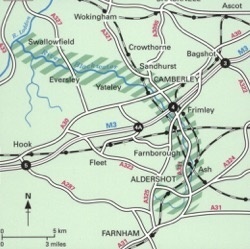 The Blackwater Valley is located on the borders of Hampshire, Surrey and Berkshire and runs for approximately 30km from the source near Aldershot, northwards to Swallowfield. At its confluence it joins the rivers Whitewater and Loddon. The Loddon eventually flows into the River Thames near Reading. Despite being surrounded by urban development the Valley provides an important green corridor for local residents. As well as the Blackwater Valley Site of Special Scientific Interest (SSSI) and a small part of the Basingstoke Canal SSSI, three nature reserves within the Valley catchment and many other areas have been recognised for their ecological importance. The local planning authorities covering the Valley have designated 31 other areas as ‘Wildlife Sites’. The Blackwater Valley has a surprisingly varied landscape rich in wildlife, and the shallow floodplain along the river, set amidst extensive heathlands and woodlands, contains many lakes and wet meadows created by many years of gravel and sand extraction. Over 300,000 people live in this area and the network of public green spaces and footpaths adds greatly to their quality of life.